Begin by exploring Sri Lanka's 'cultural triangle' of Dambulla, Sigiriya and Polonnaruwa where you wander amongst well-preserved 12th century ruins, climb the Sigiriya Rock Fortress, and experience rural village life in the remote town of Hiruwadunna. You will also have the opportunity to see elephants in their natural environment on a safari in Minneriya National Park. Next stop is Kandy, Sri Lanka's 'cultural capital'. Aside from visiting the most important sites such as Temple of the Tooth, you will also have time at leisure to enjoy the tranquil surroundings of your tea plantation estate accommodation, and learn more about the history and origins of your humble cup of tea! From here we take a scenic rail journey to the town of Ella, and continue on to the stunning 98 Acres Resort & Spa. 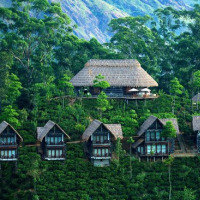 From here you may choose to hike to the top of Little Adam's Peak, take a pleasant walk to a waterfall, or relax and indulge in a spa treatment! There are also biking excursions available at an additional cost. After being surrounded by seas of green for the last week, we then head to the coast where you can soak up the sea views, framed by palm trees, from your colonial villa accommodation. Last stop on this journey is Galle, where we stay within the World Heritage listed Galle Fort. Please note this is a suggested itinerary. As it is an independent itinerary, we can make modifications to suit your timeframe, interests, and budget. Please let us know if you would like us to create a tailor-made itinerary just for you! We have carefully selected boutique hotels which offer both comfort and character, as well as providing excellent value for money. 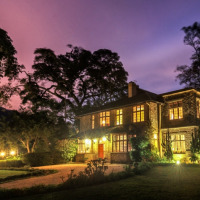 On arrival you will stay at The Wallawwa, a beautiful colonial manor house set amongst 3 acres of landscaped grounds. A dip in the pool or a treatment at the Z Spa will help revive you after your flight, while top quality food, a drink on the veranda and luxurious interiors will get your holiday off to a good start. Jim's Farm Villas in Dambulla is a charming property set in a 50 acre organic farm with serene mountain views. If time permits you may choose to try a tradtional Ayurvedic treatment in the spa or join the chef for a cooking lesson. If you can spare an additional night, there are plenty of additional activities on offer from farm tours, cycling the surrounding countryside, visits to nearby buddhist temples, spice gardens or the local village or walking in the Knuckles Ranges. Please advise if you would like the supplement for an additional night. 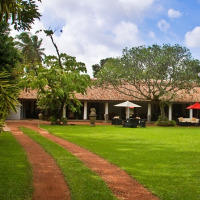 In Kandy you will stay at Taylor's Hill, a stylish tea estate hotel. 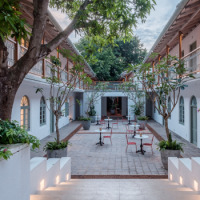 Built more than 100 years ago, this boutique hotel effortlessly blends modernised comfort with the sense of the important history and legacy of tea in Ceylon. There are beautiful spaces, both inside and out, for relaxing or enjoying a traditional afternoon tea, or perhaps a picnic on the estate. In the beautiful hill country of Ella, enjoy some time at leisure (or opportunity for adventure!) at the unique 98 Acres Resort & Spa. 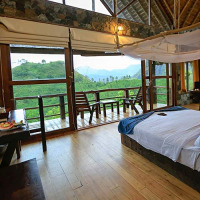 Surrounded by a stunning mountain landscape, within a 98 acre tea estate, this award winning resort consists of charming, rustic thatch-roofed bungalows nestled in the hillside. A great base for some short hikes, or simply a beautiful place to relax! 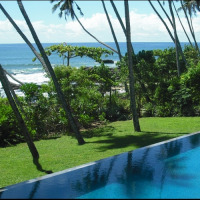 On the South coast of Sri Lanka we stay in Tangalle at the intimate Coco Tangalla. 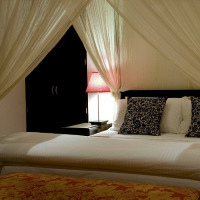 This luxury colonial beach villa overlooks the Indian Ocean and consists of just 6 rooms, offering personalised service. Enjoy beautiful fresh food (with plenitful freshly caught seafood!) and relax by the infinty pool. Please note swimming is not advised in the sea on the adjacent beach, however there is a swimming beach within walking distance. 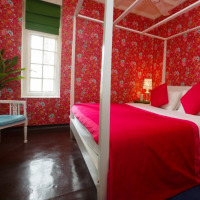 Lastly, spend a night in Galle Fort, at the newest boutique hotel, Fort Bazaar. Set within a restored 17th century townhouse, the interior exudes understated luxury. The hotel's bar and restaurant, Church Street Social, offer top notch Sri Lankan and Asian fusion cuisine using locally sources ingredients (much of which they grow themselves). Their day spa tops off the package. Please note we have carefully selected these 4 - 5 star boutique hotels for their comfort and charm as well as value for money. If you would prefer to upgrade to more luxurious accommodation we are happy to suggest alternative options for you. Additionally, should the selected hotels be unavailable for your chosen dates, we will suggest alternative options of a similar standard and price. On arrival at Bandaranaike International airport, you will be warmly greeted and transferred to your hotel in Kotugoda (approx. 20 mins), where the remainder of your afternoon is at leisure. After breakfast you will be transferred to Dambulla (approx. 4 hours). En route, visit Dambulla Cave Temple, a UNESCO World Heritage Site. Dating back to the 1st century BC, it is the largest and best-preserved cave temple complex in Sri Lanka. 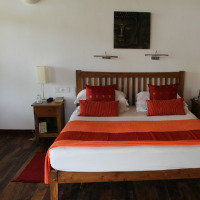 Continue on to your boutique accommodation set amidst a 50 acre organic farm. Today following breakfast you will be driven to Sigiriya (approx. 45 mins), where you will have the opportunity to climb Sigiriya Rock Fortress, another UNESCO World Heritage Site. Commmonly called the 'Fortress in the Sky'. this monolithic rocky outcrop is possibly Sri Lanka's most dramatic sight. It is also known as Lion Rock because of the huge lion that used to stand at the entrance to the Palace on the summit of the 600-foot rock. Continue on to visit the remote village of Hiruwadunna and experience Sri Lanka's unhurried rural village life. Join a fisherman in his catamaran as it meanders along a tranquil lake, observing cormorants, kingfishers, and brahmini kites stalking their prey. Once back at the river bank, share a lunch of rice and curry with the villagers. This morning you will be driven to the ancient city of Polonnaruwa (approx. 1.5 hours), yet another UNESCO World Heritage Site. Another important royal capital (Sri Lanka's 2nd capital, following Anuradhapura), with its well-preserved 12th century ruins & impressive stone culture recalls an inspired past. Later in the afternoon take a safari at the Minneriya National Park, popular for Elephant gatherings. Transfer this morning to the lakeside city of Kandy (approx. 2 hours). Kandy was the capital of the last Sinhalese kingdom, which fell to the British in 1815. It is generally recognised as Sri Lanka's cultural capital and is also a UNESCO World Heritage Site, partly due to the Temple of the Tooth, which you will visit. The Temple houses a tooth relic of the Lord Buddha and is considered one of Sri Lanka's holiest shrines. Kandy is also surrounded by tea estates, which is where you will be based for the next two nights. Today, go on a tea tasting excursion with a professional, visiting the Loolecondera Tea Factory and Estate. This was the first tea factory in Sri Lanka, set up by James Taylor, whom Taylor's Hill hotel is named after. The remainder of your day is at leisure. This morning you will be transferred to Peradeniya train station (approx. 1 hour) for the scenic rail journey to Ella (approx. 5 hours). On arrival you will be met and transferred to the resort. Today is at your leisure. If you are feeling energetic, you might like to hike up to Little Adam's Peak, or climb Ella Rock. There are also a number of waterfalls which are a short walk from the resort. A number of other activities are available locally at an additional charge, such as cycling trips, archery and helicopter flights. Or of course, you can just relax by the pool and soak up the scenery, or perhaps treat yourself to a massage! Today, transfer to Tangalle (approx. 5 hours) after a leisurely breakfast. The remainder of the afternoon is at leisure. A full day at leisure to relax and soak up the gorgeous view, take a walk along the palm fringed beach or cool off in the infinity pool overlooking the Indian Ocean. There is also the option to visit the Rakawa Turtle Hatchery or Kudawella blow hole. Enjoy a leisurely breakfast before transferring to Galle Fort (approx. 2 hours). Explore Galle Fort with its low lined streets and history behind its Rampart. The Fort remains a hive of activity and is one of the few World Heritage listed sites in which a bustling population continues to thrive. The city has a colorful history, with a Dutch atmosphere which is very much alive and its most popular site is the magnificent Dutch fort. Today you will be transferred to the airport in time for your onward flight (approx. 2.5 hours). Alternatively, please let us know if you would like to add a night at The Wallawwa. This itinerary can depart any day of the year, subject to availability. This is a private itinerary so the group size is up to you! Sri Lanka's climate is affected by two monsoons. The 'yala' monsoon brings rain to the west and southwest coasts and hill country from April/May to September, whil the 'maha' monsoon hits the east coast from November to March. There is also an inter-monsoonal period of unsettled weather in October/November during which heavy rain and thunderstorms can occur anywhere across the island. This means that the best time to visit the west and southwest coasts and hill country (as covered in this itinerary) is from December to March. This itinerary suits all fitness levels. At Sigiriya Rock Fortress, the climb is optional, but worthwhile for those with moderate fitness (there are 1200 steps). While at Ella, there are optional walks and/or cycling trip for those who would like to make the trip a little more active.